Children are always fond of their birthdays. For parents it is always a challenge to celebrate their kids’ special day in unique way. What about turning your child’s next birthday party more fun and exciting? Yes, it is possible with Exoticar. We can help you celebrate it in the classiest way by offering you finest party limousine in Melbourne. If you want to make your toddler’s Hollywood dream come true, nothing could be better option. On their special day we ensure to arrange a special ride for them. Our specific birthday party limousine services are waiting for you. Leave your worries about car pooling to us. 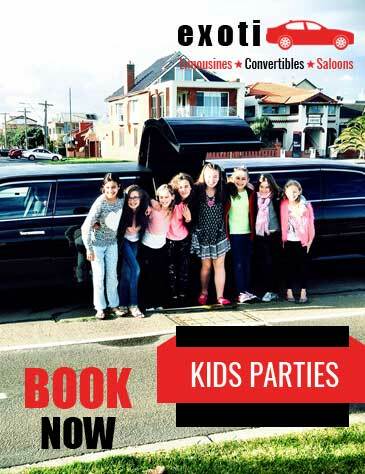 WHY YOU NEED TO HIRE LIMOUSINE FOR YOUR KIDS’ PARTIES? When it comes to planning kids’ party, hiring a limo might not be the first thing. Only few parents would give it a thought. But you need to understand that these luxury vehicles are not just for grown-ups. In fact, these are more loved by little ones. They are found to be more fascinated about luxury rides. So these serve to be a great choice for transportation for kids’ parties in Melbourne. Your kids will enjoy a luxuriant drive. Children will have a room to be rowdy in a spacious limo. We make sure that your day turns more special with our services. At Exoticar we cater best range of limousines. We are serving across Melbourne to make your every occasion special. Let us offer an unforgettable riding experience. WHAT MAKE US DIFFERENT FROM THE CROWD? Exoticar comes out to be the most perfect choice when you need a limousine. Whether you need it for birthday party or want to celebrate Christmas, we can arrange it for every occasion. We pride ourselves in making your day worth celebrating. We deliver unparalleled style and services. We can arrange drinks and nibbles on the transfer to kids’ party venues. We have an exclusive range of the most luxurious limousines. We offer limo hire service with personalized packages. We make sure that your kids are in good hands. If you want to gift your child an experience which they will never forget, we can be helpful. Our well-trained chauffeurs ensure to create everlasting memories. We will make your child feel like a celebrity for the day. Call us for bookings now.